Monro, Inc. announced that it has signed a definitive agreement to acquire 12 retail tire locations in Louisiana, a new state for Monro, further expanding the company’s geographic footprint into southern markets. These locations are expected to add approximately $15 million in annualized sales, representing a sales mix of 35% service and 65% tires. The acquisition is expected to close in the fourth quarter of fiscal 2019 and to be breakeven to diluted earnings per share in fiscal 2019. In the third quarter of 2018, the company completed the previously announced acquisition of five retail locations in Ohio. These locations are expected to add approximately $5 million in annualized sales, representing a sales mix of 70% service and 30% tires. Early in the fourth quarter, they completed the previously announced acquisition of 13 retail locations in Florida. These locations are expected to add approximately $12 million in annualized sales, representing a sales mix of 65% service and 35% tires. According to the company, the previously announced acquisition of seven stores, representing $8 million in annualized sales, is not expected to close as the company has decided to not pursue the acquisition following an extended due diligence period. On a combined basis, acquisitions completed and announced to date in fiscal 2019 represent an expected total of $87 million in annualized sales. News of the acquisition was announced in the company’s earnings report to investors earlier this week. Sales for the third quarter of the fiscal year ending March 30, 2019 (“fiscal 2019”) increased 8.5% to $310.1 million, as compared to $285.7 million for the third quarter of the fiscal year ended March 31, 2018 (“fiscal 2018”). The total sales increase for the third quarter of $24.4 million was driven by sales from new stores of $19.8 million, including sales from recent acquisitions of $14.3 million, and a comparable store sales increase of 2.2% on a reported basis. When adjusted for one less selling day in the current year quarter due to a shift in the timing of the Christmas holiday from the fourth quarter in fiscal 2018 to the third quarter in fiscal 2019, comparable store sales increased 3.3%. Comparable store sales, adjusted for days, increased approximately 12% for brakes, 3% for tires, 1% for alignments, were flat for maintenance services and decreased approximately 4% for front end/shocks. Gross margin increased 60 basis points to 38.0% in the third quarter of fiscal 2019 from 37.4% in the prior year period, primarily due to benefits from the Company’s initiatives to optimize its product and service offerings with the introduction of Good-Better-Best service packages earlier this year, optimization of its store staffing model and from leverage from higher comparable store sales, partially offset by the impact of sales mix from the Free Service Tire acquisition. Total operating expenses increased by $9.6 million to $87.3 million, or 28.1% of sales, as compared to $77.7 million, or 27.2% of sales in the prior year period. Operating expenses for the third quarter included $1.5 million in costs related to the Company’s Monro. Forward initiatives, of which $.4 million were onetime in nature, as well as $.4 million of corporate and field management realignment costs. Operating expenses for the third quarter of the prior year period included $2.0 million in litigation settlement costs and $.7 million in management transition costs. The remaining year-over-year dollar increase represents expenses from 48 net new stores, as well as higher incentive pay related to improved financial performance. Operating income for the third quarter of fiscal 2019 was $30.7 million, or 9.9% of sales, as compared to $29.3 million, or 10.3% of sales in the prior year period. Adjusting for the impact of the Christmas holiday shift, operating income for the third quarter of fiscal 2019 was 10.3% of sales. Interest expense was $6.8 million for the third quarter of fiscal 2019 as compared to $6.1 million for the third quarter of fiscal 2018. Net income for the third quarter of fiscal 2019 was $20.5 million, as compared to $11.6 million in the same period of the prior year. Diluted earnings per share for the third quarter of fiscal 2019 were $.61, including $.01 of one-time costs related to Monro. Forward investments, $.01 of corporate and field management realignment costs, $.04 negative impact from the Christmas holiday shift and $.06 benefit from a one-time income tax adjustment. This compares to diluted earnings per share of $.35 in the third quarter of fiscal 2018, which included $.15 of one-time costs, representing a 74.3% year over-year increase. The one-time costs incurred in the third quarter of fiscal 2018 consisted of $.01 per share in management transition costs, $.04 per share in litigation settlement costs and $.10 per share related to the net impact of newly enacted tax legislation. Net income for the third quarter of fiscal 2019 reflected an effective tax rate of 15.3%, as compared to 50.1% in the prior year period. The decrease in the effective tax rate was primarily related to a reduction in the federal income tax rate as a result of the enactment of the Tax Cuts and Jobs Act, the one-time income tax benefit adjustment in the third quarter of fiscal 2019 and the one-time income tax expense adjustment in the prior year period. 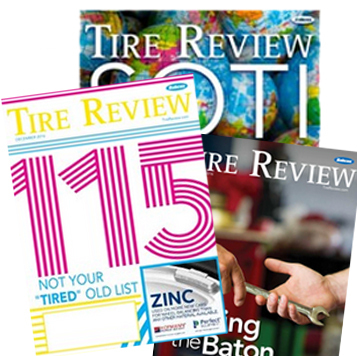 “We delivered our fourth consecutive quarter of positive comparable store sales growth and achieved a third quarter record earnings per share, reflecting sustained demand in our tire and brake categories and solid execution across our business. Forward initiatives continue to gain traction, and I am pleased to report that we successfully implemented our standardized in-store operating procedures and store refresh program at our 31 pilot locations in Rochester, NY. We are encouraged by the outperformance of these stores and look forward to expanding this initiative across our store base. Additionally, we continue to capitalize on accretive acquisitions and plan to enter a new state in the fourth quarter with a 12 store acquisition in Louisiana, further expanding and diversifying our geographical footprint,” said Brett Ponton, president and chief executive officer. For the nine-month period ended December 29, 2018, sales increased 8.4% to a record $913.0 million from $842.2 million in the same period of the prior year. Comparable store sales increased 2.4% on a reported basis, and 2.8% when adjusted for one less selling day due to the Christmas holiday shift, compared to a decrease of .7% in the prior year period. Gross margin for the nine-month period was 38.9% of sales and remained flat compared to the prior year period. Operating margin was 10.8% of sales for the nine-month period, compared to 11.5% in the prior year period. Net income for the first nine months of fiscal 2019 was $62.9 million, or $1.87 per diluted share, as compared to $46.5 million, or $1.39 per diluted share in the comparable period of fiscal 2018. Based on current sales, business and economic trends, and recently announced and completed acquisitions, the Company continues to expect fiscal 2019 sales to be in the range of $1.185 billion to $1.215 billion, an increase of 5.1% to 7.7% as compared to fiscal 2018 sales. Fiscal 2019 sales guidance continues to assume a comparable store sales increase of 1% to 3% on a 52-week basis. The Company reiterates its fiscal 2019 diluted earnings per share guidance range of $2.30 to $2.40. This guidance compares to diluted earnings per share of $1.92 in fiscal 2018. The diluted earnings per share guidance is based on 33.6 million diluted weighted average shares outstanding.